Lessons from the Arctic honours the travels of legendary Norwegian explorer Roald Amundsen, the first person to reach the South Pole. Amundsen also travelled to the North Pole and through the Northwest Passage. The exhibit offers a glimpse into a life devoted to polar exploration. Photos show important accomplishments as well as everyday moments from Amundsen’s life, revealing the demanding conditions of his travels and highlighting his deep respect for the people who trained him to survive: the Inuit. Artifacts, such as the signed Norwegian flag Amundsen carried with him and planted at the South Pole, snowshoes, maps, dinnerware and cutlery used more than 100 years ago, offer a more tactile glimpse into Amundsen’s life away from home. 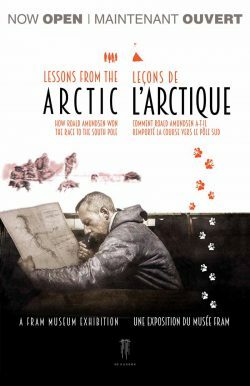 Lessons from the Arctic is presented in partnership with Royal Norwegian Embassy. This exhibition of contemporary artwork by renowned Alberta artist Chris Cran, features some of Canada’s greatest explorers and geographers. 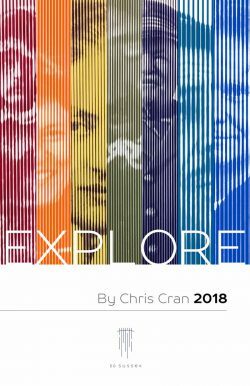 EXPLORE includes portraits of Canadian geography legends such as RCGS founder Charles Camsell, geologist Joseph Burr Tyrrell, Arctic explorer Joseph-Elzéar Bernier, geologist Alice E. Wilson and Inuit oral historian Louie Kamookak. Cran is known for his ability to challenge perception by playing with illusion and for exploring, borrowing from and overturning traditional artistic genres to create alluring works of art. Compass: Peace in All Directions is a feature attraction for the RCGS Summer Exhibits Series, located on the front lawn of the new RCGS headquarters. This imaginative, site-specific, temporary art installation displays 3,500 handmade ceramic sculptures of roses, feathers, birds and fleur-de-lis, all elevated on steel rods. 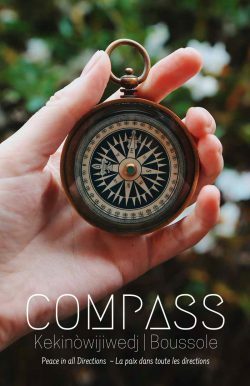 It uses the RCGS signature compass rose as a focal point to symbolically bring together the founding peoples of Ottawa at the time of Confederation, in a move towards the goal of peaceful coexistence. The RCGS Summer Exhibits Series is open to the public in Canada’s Centre for Geography and Exploration at 50 Sussex until September 15, 2018. Admission is free.